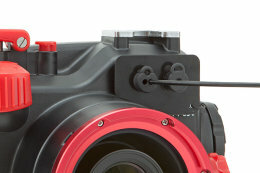 Lots of camera housings rely on an unreliable push fit connector to attach the fibre optic cable from your INON strobe. The push fit connector has become an industry standard, but the ease with which the cable can become separated from the housing is well known. This invariably leads to missed pictures while the problem is identified and solved. Where possible, such as on their INON X2 housings and fibre optic cable sets, INON provide a locking mechanism to ensure the housing end of the cable cannot easily pull out. 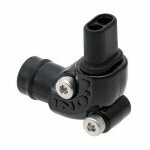 But if you are stuck with the push fit connector used by most housing manufacturers, here’s two things you can do to mitigate the problem. Firstly, if you use the INON Double Hole Rubber Bush attachment, always carry spares. They are easily lost if the cable pulls out of your housing. Thread a spare onto your cable above the one you will be using. If you lose the first bush, the second is immediately to hand and you can be shooting strobe pictures again in seconds. Secondly, consider upgrading to the inexpensive INON Rubber Bush Type L. This clips around your INON fibre optic cable and is secured by screws. It might still be pulled out of your housing, but it can’t come off your cable. It also leads the cable away from your housing at a right angle, making cable management neater with many systems and further reducing the risk of the cable pulling out unexpectedly. 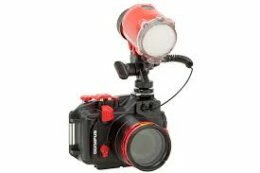 INON X2 CSC and SLR camera housings and many INON cable sets for compact cameras feature a locking mechanism to secure the cable into place. The industry standard housing connection is an unreliable friction fit. It is easy to pull the cable out by accident. INON's Rubber Bush Type L provides two benefits over the standard Double Hole Rubber Bush. Firstly, because it clips around the cable using screws, it is a permanent fitting and cannot easily be lost. Secondly, it leads cables off at a right angle, which helps with cable management and reduces the risk of the cable drifting into shot.